Used Lunar Pixi For Sale. Refurbished, Pre-Owned & Reconditioned Bone Densitometers at Reasonable Prices. Used and Refurbished Radiology Equipment and X-Ray Equipment, Used and Refurbished Diagnostic Imaging Equipment, Used Cath Labs, Used C-Arms, Used MRI Systems, Used CT Scanners, Used PET Scanners, Used Nuclear Medicine Equipment, Used Mammography Equipment, Used Fluroscopy Equipment and Used Cardiology Equipment. Description: PIXI is the worlds fastest peripheral densitometer. It provides precise assessment of bone mineral density (BMD) with excellent image resolution (0.2 mm pixels). PIXI is the only peripheral densitometer that allows the operator to examine both the os calcis and the forearm. The heel is a weight-bearing site, like the femur; both sites provide useful clinical results. The high metabolic activity of trabecular bone in the heel makes it responsive to therapy. The heel, like the spine, shows increases in response to therapy with estrogen, calcitonin or bisphosphonates. Forearm BMD is less useful diagnostically in patients under 70 years but can help physicians assess the effects of secondary hyperparathyroidism that is common in the most elderly. Throughput and Convenience PIXI uses advanced cone-beam geometry and a solid-state area detector for fast imaging. Images are acquired in only 5 seconds. 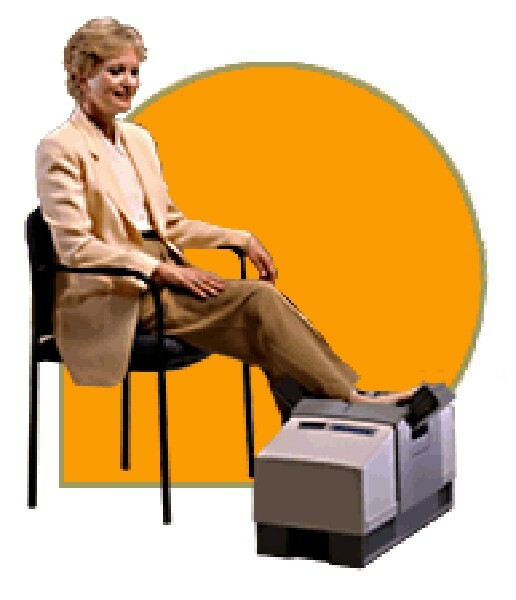 PIXI employs the dual-energy x-ray absorptiometry (DEXA) technique, eliminating the need for waterbaths or gels, as well as removal of stockings. PIXIs fast throughput is perfect for large practices, 100-200 per day. Ease of Use PIXI is driven by single-key commands and a graphical user interface. A single function key performs image acquisition and analysis. Patient results are printed in a clear, easy-to-interpret format. Precision and Stability PIXIs high-resolution imaging allows consistent, automated positioning for superior precision. Quality assurance is fully automated. Reliability PIXI is the only bone densitometer with just one moving part. The stationary area detector and cone-beam x-ray source eliminate mechanized scanning. Robust solid-state design provides unprecedented reliability.